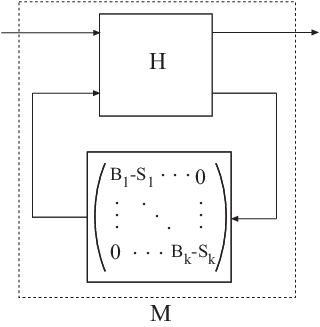 [H,B,S] = getLFTModel(M) extracts the components H, B, and S that make up the Generalized matrix or Generalized LTI model M. The model M decomposes into H, B, and S. These components are related to M as shown in the following illustration. The cell array B contains the Control Design Blocks of M. The component H is a numeric matrix, ss model, or frd model that describes the fixed portion of M and the interconnections between the blocks of B. The matrix S = blkdiag(S1,...,Sk) contains numerical offsets that ensure that the interconnection is well-defined when the current (nominal) value of M is finite. Generalized LTI model (genss or genfrd) or Generalized matrix (genmat). 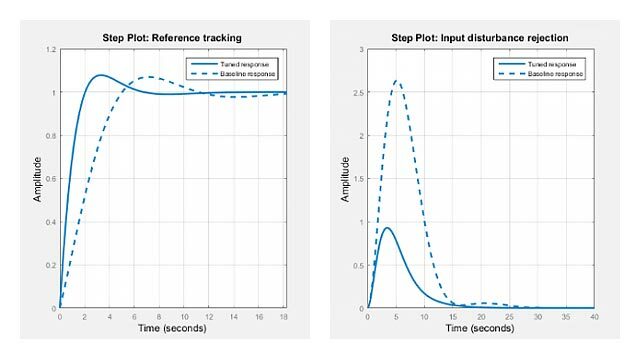 Matrix, ss model, or frd model describing the numeric portion of M and how it the numeric portion is connected to the Control Design Blocks of M.
Cell array of Control Design Blocks (for example, realp or tunableSS) of M.
Matrix of offset values. The software might introduce offsets when you build a Generalized model to ensure that H is finite when the current (nominal) value of M is finite. getLFTModel gives you access to the internal representation of Generalized LTI models and Generalized Matrices. For more information about this representation, see Internal Structure of Generalized Models.